LONDONDERRY – Frustration has been expressed by residents of Windham Country in southern Vermont, thanks to new information coming from the governor’s office. 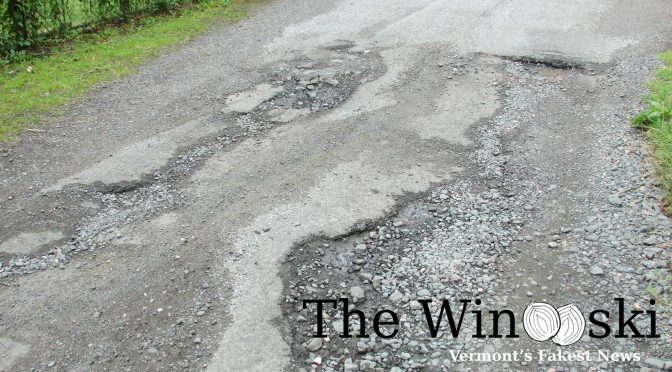 VT Route 11, especially between Londonderry and Chester, has fallen into almost total disrepair, and the local citizens have now been told that the damage is the work of a Crumple-Horned Snorkack. I say this road is the worst road I have ever seen. I had to travel it in February with Shingles rash on my back and the trip was sheer torture. I understand that the huge trucks going through to Albany at night is part of the problem. I suggest the people in charge and a contingent of senators from other parts of the state come down and have a lovely day riding on it. LOL…what’s next….good excuse for ignorance. Wow blame it on a mythical character from Harry Potter that supposedly lives in Swenden ? More and More I want to move out of this State. Just don’t move to Sweden! Their mythical creatures are as fake as this story! Thanks for the southern Vermont love! Nice to see recognition of life south of Rutland from a state-wide media outlet. And, after reading your comment sections, may I suggest an article? “Survey Shows Some Vermonters Don’t Recognize Satire.” Best of luck with that. Fantastic idea. We are definitely using it! Huh. We thought the Vermont Crumple-Horned Snorkack area of interest was fairly exclusive. But hey, go ahead! As long as you don’t quote full posts and make sure to credit and link back, feel free to quote away!